Monitor when messages arrive (auto-complete) or are received (peek-lock) in queues, topics, and topic subscriptions. Create and delete topic subscriptions. Manage messages in queues and topic subscriptions, for example, get, get deferred, complete, defer, abandon, and dead-letter. Renew locks on messages and sessions in queues and topic subscriptions. Close sessions in queues and topics. You can use triggers that get responses from Service Bus and make the output available to other actions in your logic apps. You can also have other actions use the output from Service Bus actions. 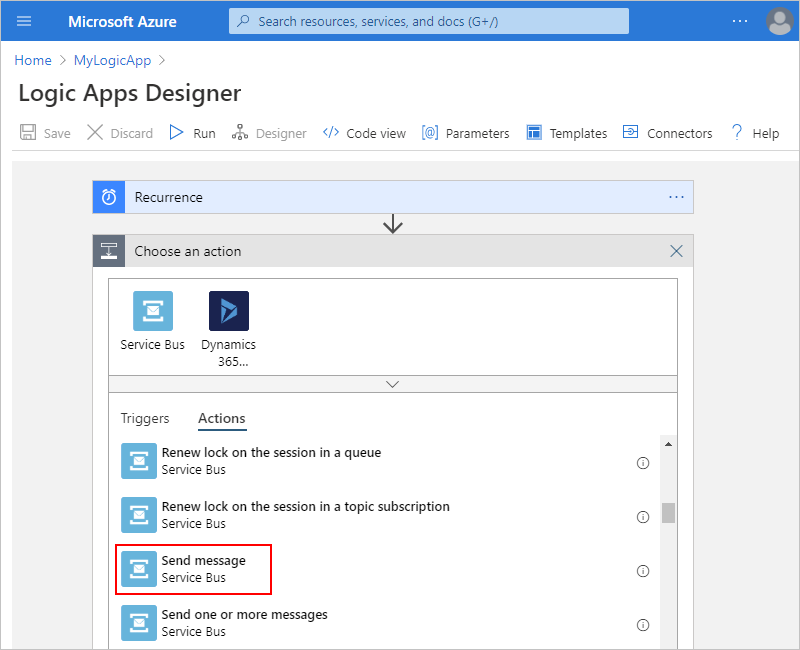 If you're new to Service Bus and Logic Apps, review What is Azure Service Bus? and What is Azure Logic Apps?. A Service Bus namespace and messaging entity, such as a queue. If you don't have these items, learn how to create your Service Bus namespace and a queue. These items must exist in the same Azure subscription as your logic apps that use these items. The logic app where you want to use Service Bus. Your logic app must exist in the same Azure subscription as your service bus. To start with a Service Bus trigger, create a blank logic app. To use a Service Bus action, start your logic app with another trigger, for example, the Recurrence trigger. 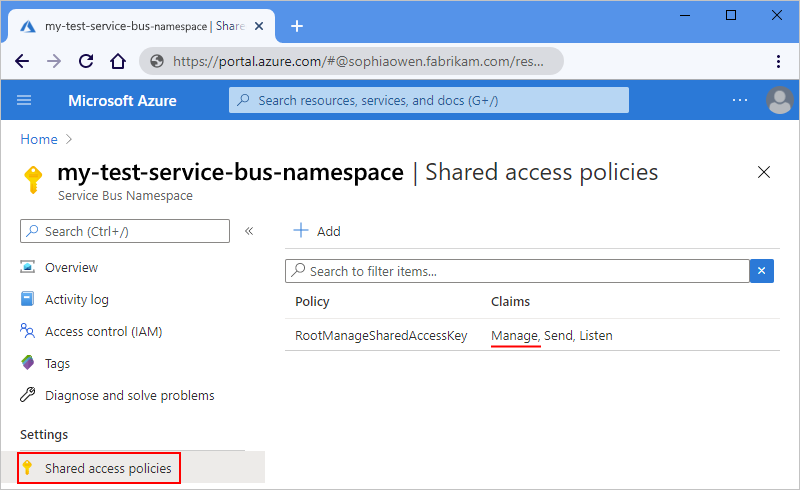 Confirm that your logic app has permissions for accessing your Service Bus namespace. Get the connection string for your Service Bus namespace. You need this string when you enter your connection information in your logic app. Next to your primary connection string, choose the copy button. Save the connection string for later use. 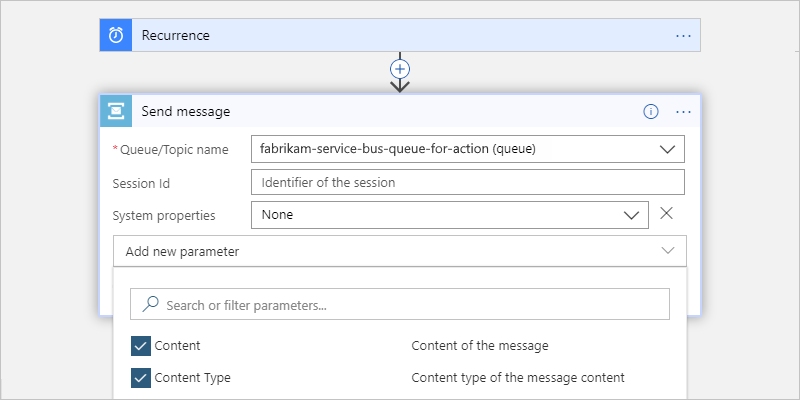 To confirm whether your connection string is associated with your Service Bus namespace or a messaging entity, such as a queue, search the connection string for the EntityPath parameter. If you find this parameter, the connection string is for a specific entity, and isn't the correct string to use with your logic app. 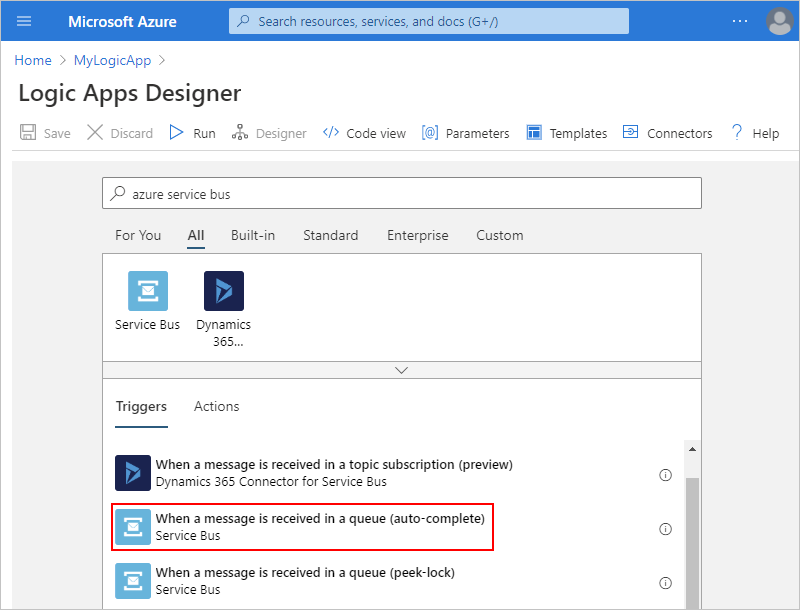 To add a trigger to a blank logic app, in the search box, enter "Azure Service Bus" as your filter. Under the triggers list, select the trigger you want. Some triggers can return one or messages, for example, the trigger, When one or more messages arrive in a queue (auto-complete). When these triggers fire, they return between one and the number of messages specified by the trigger's Maximum message count property. All Service Bus triggers are long-polling triggers, which means when the trigger fires, the trigger processes all the messages and then waits 30 seconds for more messages to appear in the queue or topic subscription. If no messages appear in 30 seconds, the trigger run is skipped. Otherwise, the trigger continues reading messages until the queue or topic subscription is empty. The next trigger poll is based on the recurrence interval specified in the trigger's properties. Under the last step where you want to add an action, choose New step. To add an action between steps, move your pointer over the arrow between steps. Choose the plus sign (+) that appears, and then select Add an action. In the search box, enter "Azure Service Bus" as your filter. Under the actions list, select the action you want. If you're connecting your logic app to your Service Bus namespace for the first time, the Logic App Designer now prompts you for your connection information. Provide a name for your connection, and select your Service Bus namespace. To manually enter the connection string instead, choose Manually enter connection information. If you don't have your connection string, learn how to find your connection string. 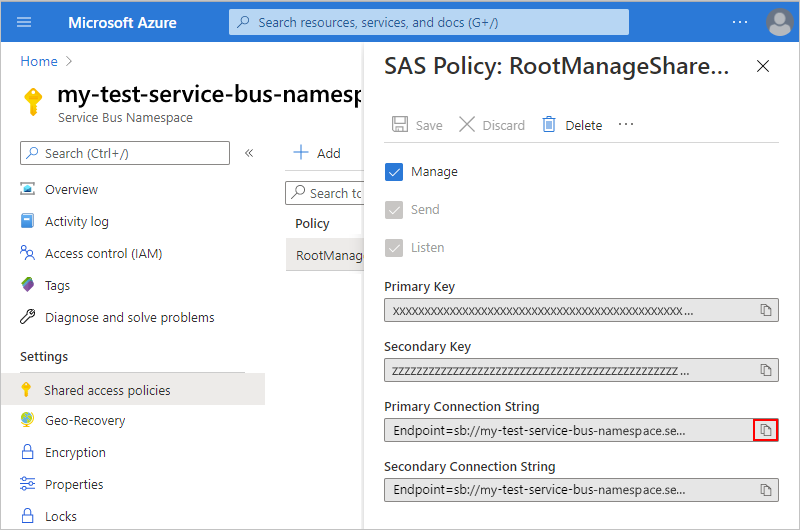 Now select your Service Bus policy, and then choose Create. For this example, select the messaging entity you want, such as a queue or topic. In this example, select your Service Bus queue. For the sample trigger: Set the polling interval and frequency for checking the queue. When you're done, continue building your logic app's workflow by adding the actions you want. For example, you can add an action that sends email when a new message arrives. When your trigger checks your queue and finds a new message, your logic app runs your selected actions for the found message. For the sample action: Enter the message content and any other details. When you're done, continue building your logic app's workflow by adding any other actions you want. For example, you can add an action that sends email confirming your message was sent.